Lee Ewing, National Gallery of Art photographer, explores the challenges of photographing Edgar Degas’s Little Dancer Aged Fourteen. 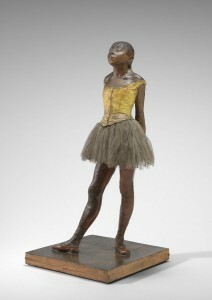 The only sculpture that Degas exhibited during his lifetime,Little Dancer is one of the Gallery’s most important works. So fragile that it is rarely moved, this masterpiece is known for its unique mixed media: pigmented beeswax, a cotton bodice and tutu, linen slippers, and human hair. This video provides an inside look at the process of bringing this most human of artworks to life through photography.